Morse, William Inglis. The Narrowing Path, 1901-1920. Limited edition of 300. London: Printed for the author at the Curwen Press, 1933. xii, 79 pages, 19.5 cm. Edition limited to 300 copies printed on handmade paper at the Curwen Press, Plaistow, London. Main print run bound in medium blue book cloth over boards with title stamped in gold on spine. Unknown number of copies bound in full leather commissioned fine bindings by Douglas Cockerell. 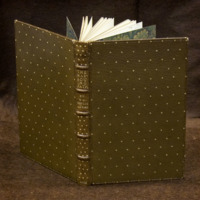 This volume is bound in medium-brown full morocco leather. 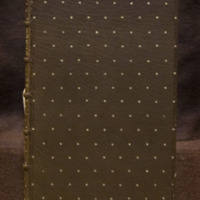 Both front and back covers are outlined by a broken blind fillet with a single gilt star ornament in the fillet gaps. Decorating the front and back covers is a field of evenly spaced rows of small gilt stars. The leather turn-ins are also adorned with single gilt stars, which fill the gaps of the inner single blind fillet. Five raised bands are prominent on the spine, forming six compartments with the title in upper case lettering and stamped in gold in the second compartment from the top. Similarly stamped in gold in upper case lettering is “BY WM. INGLIS MORSE” in the third compartment from the top, and the date of publication is stamped in gold in the bottommost compartment. Compartments one, four, and five are randomly stamped with the gilt star tool. Trimming the head and foot of the spine are four tiny gold dots and green silk head- and tailbands. All text edges are gilded. “D.C. 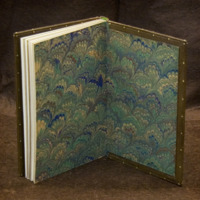 & SON 1933” is blind-stamped on the lower left corner of back cover turn-in, and the front and back endpapers feature the distinctive Cockerell marbled paper pattern in green, blue, red and gold inks. 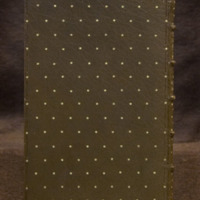 Simplicity and symmetry of the all-over cover design in small gilt star binding tool creates a pleasing and unique fine binding for William Inglis Morse’s book of poetry based partially on memories of his childhood in rural Nova Scotia. *Edward Plunkett, 18th Baron of Dunsany (1878-1957) was an Anglo-Irish writer and dramatist.